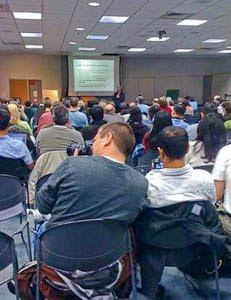 Portland Community College's Community Education has recently started a series of lunchtime program for Intel employees. 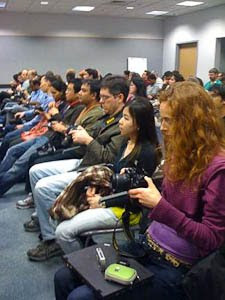 I gave the inaugural lecture on using some more creative settings on your camera to control exposure and white balance. Initially, we thought their would be approximately 30-50 people interested. As the event neared, it appeared quite a few (well over 200) had added this talk to their calendar. The day before the talk, a timely decision was made to move this to a larger venue. I made a few changes to my presentation. When the event began, there were ~40 people there. In another 5 minutes, another 150 people appeared! People were standing in the back. Total count was over 200. The talk went well, with a very attentive group with questions and interest. It was a great way to start this series for PCC, and I enjoyed the interaction. Looking foreword to my next lecture on Travel Photography in April.